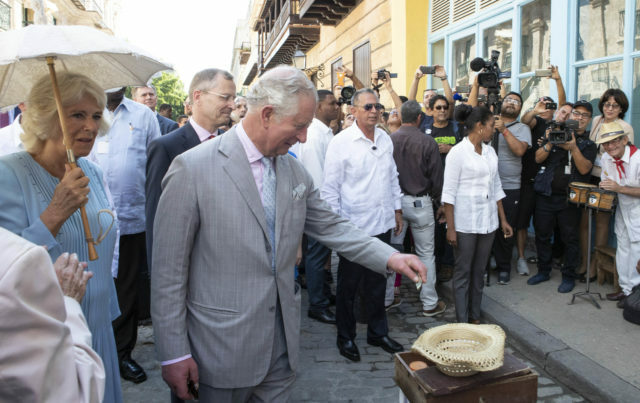 Royal protection officers and Cuban security had their hands full keeping back the crowds from Charles and Camilla as they explored the Unesco World Heritage Site. Camilla carried a parasol to ward off the searing sun but Charles managed to keep cool in a shirt, tie and suit during their guided tour. The old town has retained many of its 18th-century colonial Spanish buildings, with their verandas, brightly-coloured frontages and internal courtyards, with several renovated in recent years. Stray dogs wandered across the royal couple’s path and, like Cuba’s citizens who benefit from their country’s renowned healthcare system, they have been vaccinated, and their claws clipped. The couple stopped by a group of elderly street musicians and, as a huge media scrum tried to capture the moment, Charles put a note in their collection hat. Camilla wandered over to a group of American tourists who questioned her about the Duchess of Sussex’s pregnancy. The couple began their tour in Arms Square, close to the site where the Spanish established the city on November 16, 1519. They briefly visited the El Templete – small temple – a building from 1828, and as they left, the crowds swarmed around them. The prince and duchess have made history by becoming the first members of the royal family to officially visit Cuba.